It doesn't work on a real account. Opens, modifies, closes and deletes trading and pending orders from the chart using virtual lines, buttons and the active information terminal. Automatically opens an order by indicator levels. Hints in Russian, English or disabled. 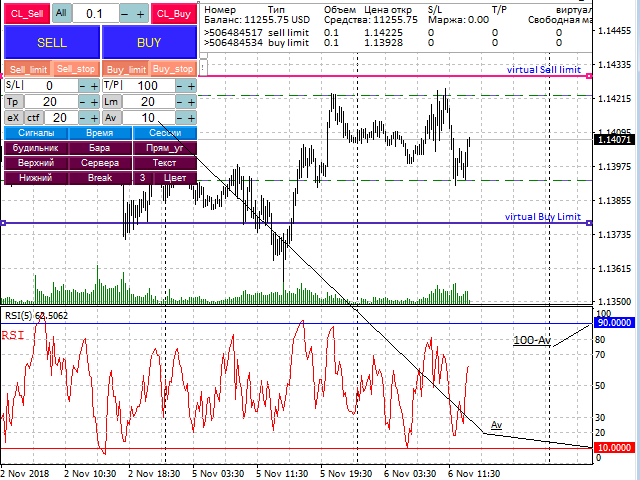 It has a number of functions for trailing virtual Take Profit lines and limit orders. Displays information on the active information terminal. Hides and includes virtual lines S/L , T / P, buttons "<>","M","X", as well as removes and closes the selected orders, resets virtual and real Stop Loss, Take Profit with the mouse from the information terminal. Trailing virtual stop and limit levels, Works in the strategy tester. There are signals when the price of lines, alarm. Until the end of the bar and the server time. Time and size of sessions. Automatically saves virtual levels and colors to your hard drive in a file. If you restart or crash your computer, you can download the data. Enable the "Black on White"color scheme. Enable automatic loading of the selected indicator " LoadIndicator "with variable mouse levels of"Av" triggers. Variable "period" for the selected indicator.